Lent is coming up soon–Valentine’s Day is also Ash Wednesday this year, so it’s just a week away! I love the observance of liturgical seasons, including Advent and Lent, and I want to make it more intentional this year. I spent some time over the weekend thinking about how I want to observe Lent this year. I haven’t made any decisions yet, but thinking about it gave me some ideas for stickers to create. Last year I gave up alcohol, which was a big deal because I was drinking a lot (more than I should have) last year. In the time since I have pretty much stopped buying alcohol for home. When I visit Indiana wineries with my mom, I tend to buy a couple of bottles, and I’ll probably still do that. I might have a beer with my burger when I eat out, and this Friday I’m taking a friend out for margaritas to celebrate her leaving a toxic work situation. Aside from that, I’m just not drinking much, so giving up alcohol wouldn’t be that much of a sacrifice. And Lent is supposed to be about giving up something that you’ll actually miss. I can’t give up caffeine because I want my coworkers to stay alive. So maybe chocolate. We’ll see. I’m still thinking. Maybe I’ll give up spending money for 40 days! 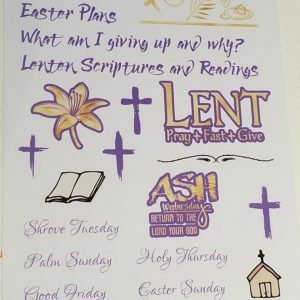 I designed some stickers for the collections I want to create: “What am I giving up and why?” and “Lenten Scriptures and Readings” I made some stickers for the specific holy days of the season: Shrove Tuesday, Palm Sunday, Holy Thursday, Good Friday, Easter Sunday. I also have a few decorative stickers with symbols from Lent, like palm branches, lilies, and crosses. I’ve thought about making a Lent tracker, but I haven’t been able to come up with a design I like. Maybe I still will, but for now, I’m going to list the stickers without a tracker–and if someone buys the Lent stickers and I’ve made a tracker I like in the meantime, I’ll send them the tracker too! Do you have Lent traditions you enjoy? Share them in the comments!